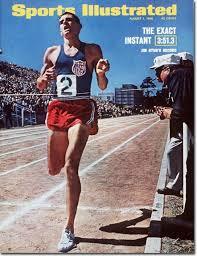 When I stated running, Jim Ryun was one of those names that was mentioned in hushed tones. He was the first high schooler to break the 4-minute mile, running 3:55.3--a record that stood until 2001 when Alan Webb ran 3:53.43. Ryun also collected a bunch of world records, competed in three Olympics, and won silver in the 1500 in 1968. Jim Ryun, in other words, is a track god. In the mid-90s, I actually met him when I lived in Kansas City. He was running a road mile and I took the opportunity to introduce myself. I'm not sure what I said. Or if I said anything. It was probably a moment of pure fear and trembling. You know, "Take off your shoes, for the place where you are standing is holy ground." Running nerds. We are a special breed. As a rule, I am not a "quote guy." That is, I don't gather quotes and toss them out in casual conversations in order to make myself seem smarter that I am. I just use words like "avuncular" to do that. But that quote has stuck with me. In fact, I carried it around in my wallet for years. It was--and is--a helpful reminder that the hot flame that we all feel when we start something new will cool with time. Then it either becomes part of our routines, or it just goes away. Running is obviously a habit for me. It's a habit that I am grateful that I could develop. But there are all sorts of other habits that I could and should be doing to avoid injury and run better. I own a foam roller. And I know exactly where it is. Bought it over a year ago. It's a nice one. I should use it at least once a day. Like, for five minutes. I don't. Why? Because I'm lazy. How about core workouts? A while ago I started a really simple--like, ten minute--routine. Lots of running friends have told me that a strong core helps to keep the injury monkey away. I think that I did the routine two ore three times. It's a good routine. You should do it. Then there's food. I read somewhere that Meb Keflezighi--who is my age and just competed at the Olympics--eats one hamburger a year. That's how he celebrates. Wild man. After that, it's back to quinoa, kale, tofu, and protein smoothies. He's not alone in this. Every time I open Runner's World they show what elite runners like Meb are eating. As I scan their daily menu, I can actually feel the shame washing over me. But it doesn't change my eating habits. Not at all. So yea, habits within habits. They're hard too. I'll keep trying, I'm sure. Who knows. Maybe something will actually stick this time.